In a major effort to understand the conditions leading to blooms of toxic algae along the California coast, a team of scientists led by the University of California, Santa Cruz, will deploy an array of sophisticated ocean monitoring technology, including robotic gliders and sensor networks. An initial grant of over $800,000 has been awarded for the first year of the planned five-year, $4.3 million project funded by NOAA's Ecology and Oceanography of Harmful Algal Blooms (ECOHAB) Program. The project will focus primarily on blooms of a type of single-celled algae known as Pseudo-nitzschia, which produces a potent neurotoxin called domoic acid. While several different types of toxic or otherwise harmful algae occur in California's coastal waters, Pseudo-nitzschia is rapidly becoming the single biggest threat, according to Raphael Kudela, professor of ocean sciences at UC Santa Cruz and lead scientist for the project. "Spring blooms of toxic Pseudo-nitzschia are now a recurring problem, first reported in central California during the 1990s and on an annual basis in southern California since 2003," Kudela said. Harmful blooms of a different type of algae--Alexandrium catenella, which produces saxitoxin and causes paralytic shellfish poisoning--have also become increasingly common and will be a secondary focus of the project. Blooms of toxic algae can appear with little or no warning and quickly grow to cover large areas of coastal waters. The toxins accumulate in shellfish and other harvested marine organisms, making them unsafe to eat and requiring monitoring and annual closures of shellfish harvesting by state agencies. The toxins also cause illness and death in marine mammals and birds. 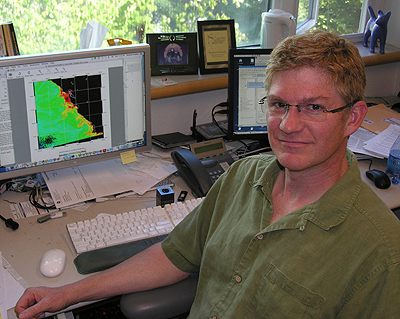 Kudela's group at UC Santa Cruz will collaborate with researchers at the University of Southern California, UCLA, Moss Landing Marine Laboratories, Monterey Bay Aquarium Research Institute, the Southern California Coastal Water Research Project, and the NOAA Center for Coastal Environmental Health and Biomolecular Research. The researchers will compare two known "hot spots" for harmful algal blooms, Monterey Bay in central California and the San Pedro Shelf area in southern California. Monterey Bay is strongly affected by seasonal upwelling of deep ocean water and also receives river outflow and land runoff influenced by extensive agricultural use of coastal land. The San Pedro Shelf experiences some coastal upwelling and receives runoff, river output, and sewage discharges from the densely populated urban area of greater Los Angeles. "We see similar blooms in both places, but the environmental conditions are different. We're hoping that by looking in two different environments we can see which factors are the same and which are different, and figure out what's causing these blooms to occur," Kudela said. Underwater robotic gliders, sensors deployed on moorings, and satellite observations will be used to monitor both study areas and document the emergence of harmful algal blooms. Detection of a bloom event will trigger ship-based biological studies to characterize the bloom in detail as it evolves. Data from the field studies will be used to guide the development of predictive computer models of the conditions that trigger the blooms. "It's a very technology-driven project, building on the expertise from the different institutions involved in the collaboration," Kudela said. "We're getting to the point where we can instrument the ocean and try to identify the conditions leading up to a bloom. If we're successful, it will give us a lot of lead time before we start to see impacts from a harmful algal bloom, and that will be very useful for the people and agencies that have to deal with those impacts."